The air is stagnant, though the doors are open. It’s cool, and the kind of silent you don’t realize till someone points it out to you. The absence of sound is appropriate, because Eastern State Penitentiary was built on the premise that quiet reflection cultivates penitence. It was the first prison built on this philosophy. The facility covers 10 acres and opened in 1829. It had central heating and running water and was considered a marvel of its time. Inside its towering stone walls are seven cell blocks radiating from a grand rotunda. Guards could stand in that bright central space and peer into any of the cell blocks, which are bathed in light from windows in the cathedral ceilings. There are a dozen or more openings along each block wall, with thick wooden doors on tracks. The entrances are short and narrow and open into cells that are 8 feet by 12 feet. Vaulted ceilings are at least twice as high as the width of the room and natural light filters in through a skylight. Each prisoner had a bed and a chest, or drawers. If they could read, they were permitted a Bible. They were given two half-hour breaks a day, where they would be led to one of the triangular yards created by the spokes of the cell blocks. Each prisoner was completely isolated. They saw no one and spoke to no one. 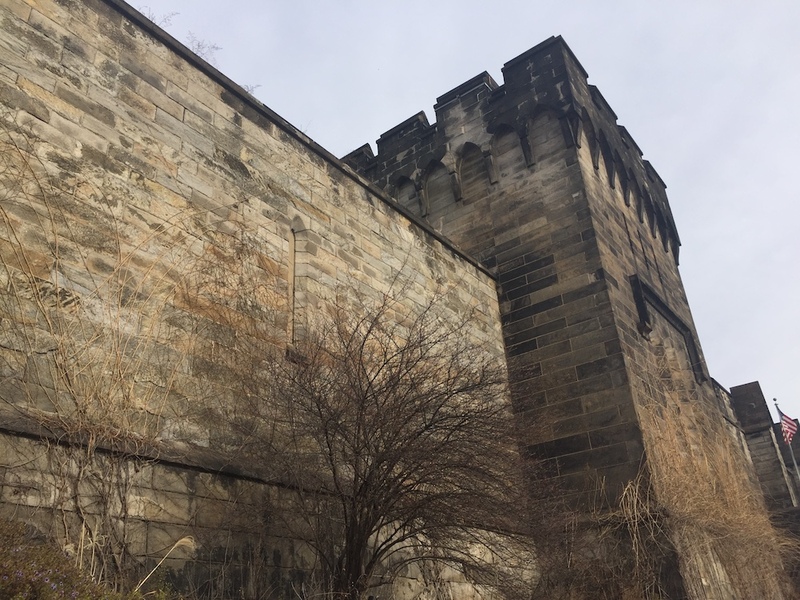 When they arrived at Eastern State, they were hooded so they could not get a sense of the layout and so they could not see their guards or recognize fellow inmates. They were fed through a trap door. They wore felted shoes so even their footsteps could not be a distraction, and the guards wore wool socks over their shoes to muffle the noise of their rounds. Their isolation was to give them space for reflection and penitence, and to protect them from “bad air” that the medical community at the time believed spread disease. This was the “separate system,” also called the Pennsylvania system, of reform philosophy that appears to have been launched in Ben Franklin’s home during a meeting of the Philadelphia Society for Alleviating the Miseries of Public Prisons. It was developed chiefly by Quakers, who knew a thing or two about prison stays, as they were often arrested for evangelism. Nevertheless, this style of rehabilitation became a model. The architecture and philosophy was adopted all over the world. The Pennsylvania system was practised here till 1913. The prison remained in operation till 1971. Eastern State Prison is maintained as a partial ruin. It was abandoned in 1971 and left to deteriorate until the mid-1990s. Audio tours are narrated by Steve Buscemi and former guards and inmates and some sections have been restored for historical interest — such as the cell Al Capone spent the better part of a year in.